Complements Legal Research Q&A: 401 Flashcards with Companion Looseleaf and Legal Research FAQs: 189 Ready Answers. Hundreds of legal research terms defined with extensive cross-references. Third edition rewritten and expanded. Full description below. 1 copy: $80; 2 copies; $152; 3 copies: $2165; 4 copies: $280; 5 copies: $340. The revised and expanded third edition is now available. Earlier editions have been purchased by law libraries, non-law libraries, and legal researchers around the world. Find the definitions you need of hundreds of terms used in legal research and bibliography. Dictionary coverage includes the judicial, legislative and executive branches of federal, state, and local government. Multiple cross-references are provided to related terms. The Legal Research Dictionary: from Advance Sheets to Pocket Parts, third edition, revised and expanded is an essential reference title for attorneys, law students, library staff, paralegals, and others. Compiled by Elyse H. Fox, JD, MSLS. Ms. Fox has worked as a law librarian for 40+ years. She previously practiced law in Chicago and Boston. She also taught legal research to law students. 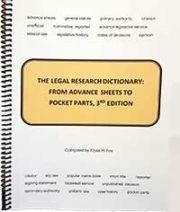 “A compilation of essential terms used in the legal research process… this edition includes quotations from a variety of publications and websites and is 30% longer than the second edition… A unique and invaluable contribution to the literature on legal research and the publications by which it is conducted….” Kendall Svengalis, Legal Information Buyer’s Guide and Reference Manual. “… Decisions, opinions and orders–what’s the difference? A reference question that comes up now and then is what’s the difference between a judicial opinion and a judicial decision? That’s an easy one, thanks to Elyse Fox’s wonderful The Legal Research Dictionary: from Advance Sheets to Pocket Parts, second edition. (I love this reference ebook! )” Paul J. Lomio, Director, Stanford Law Library (legalresearch.com, 5/08). “… Long awaited new edition of The Legal Research Dictionary now available. This handy reference work is useful for law librarians, paralegals, public librarians, law review staff, law students during first year legal research and writing, and advanced legal research courses.” Joe Hodnicki, Butler (OH) County Law Library (Law Librarian Blog: Legal Research 11/06). “… Most legal dictionaries will define the word ‘official’. I like the definition of official in The Legal Research Dictionary, Second Edition, by Elyse H. Fox. It not only defines ‘official’ in the context of legal research publications, it also includes the point that official publications may be published by a private publisher under the authority of a government entity, that is, a government entity may delegate publishing authority to a private publisher.” Laura Orr, Oregon Legal Research Blog 1/17/10, Official vs. Unofficial Sources of the Law.